It's an ongoing debate: plant protein vs. animal protein. The short answer is that both can be part of an overall healthy diet plan. Here's why. Animal vs. plant protein: For non-vegans and non-vegetarians, the answer may be somewhere in the middle. Nutrition experts stress the importance of overall “diet quality” as opposed to demonizing and avoiding particular foods or even entire food groups. “Quality” means that what you eat provides the energy and essential nutrients you need for an active, healthy life. All sources of protein, for example, are not created equal, a fact that fuels a debate over plant protein vs. animal protein. Getting too much of your protein from cured meats and processed meats—cold cuts and sausage, for example—is a no-no because those foods are strongly linked to heart disease and cancer. One way to skirt the issue of meat and health is to rely more on plant-based sources of protein, like nuts, whole grains, legumes, and tofu and other soy-based foods. Plant foods are a highly recommended foundation for healthy diets. They are packages for a wide range of essential vitamins and minerals along with fiber, antioxidants, and anti-inflammatory phytonutrients. On the other hand, animal-based protein sources also have some valuable advantages. They supply all the amino acids you need, as well as certain nutrients that are hard to obtain from plant foods. But there are some important differences you should know about when choosing plant protein vs. animal protein foods. You don’t need to choose one over the other—unless you truly want to go vegetarian or vegan. In that case, the differences between animal and plant protein become even more important. When the protein you eat is digested, it gets broken down into smaller molecules called amino acids. Amino acids and proteins are the building blocks of life. The body combines 20 different amino acids to build proteins for a wide variety of uses. The body uses amino acids to make the enzymes that digest your food, the walls of your cells, and the hairs on your head—just to name a few examples. Amino acids come in two groups: essential and nonessential. Essential amino acids are those the body cannot synthesize in adequate amounts to maintain body functions. Therefore, you need to obtain a sufficient amount of essential amino acids from food. In contrast, the body can make the 11 nonessential amino acids, either from scratch or by chemically altering other aminos. The nine essential amino acids are histidine, isoleucine, leucine, lysine, methionine, phenylalanine, threonine, tryptophan, and valine. The branched-chain amino acids leucine, isoleucine, and valine are particularly important in building muscle—hence their popularity as dietary supplements among body builders. Branched-chain amino acids are abundant in protein foods like eggs, meat, and dairy products. 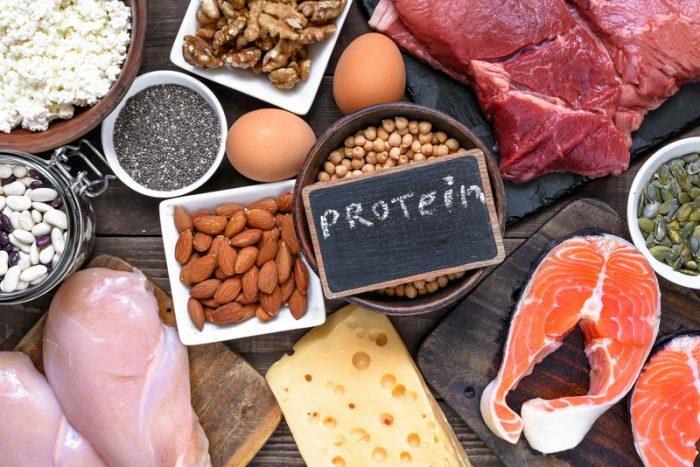 When choosing sources of protein to incorporate into meals, it’s important to obtain complete proteins, either by choosing certain high-quality proteins or by combining different protein foods. Complete proteins provide the full range of amino acids you need, and in the optimal proportions. Vitamin B12: This essential vitamin is found in good amounts in fish, meat, poultry, and dairy products. Vitamin D: This is found in oily fish, eggs and dairy. Iron: This nutrient is found in abundance in its “heme” form in meat (particularly red meat). The body absorbs heme iron more easily than the type of iron found in plants. Zinc: Beef, pork and lamb are good sources of zinc in a chemical form that the body absorbs more readily than the zinc in plant foods. Seafood is widely touted for its health benefits. Experts recommend two or more fish meals a day to obtain not only high-quality protein but heart healthy omega-3 fatty acids. Plant sources of protein also provide fiber. That’s important, because fiber aids digestion and is associated with healthier overall eating patterns. Plants also offer a chance to obtain plant-produced phytonutrients with a variety of potential benefits. Phytonutrients have antioxidant and anti-inflammatory properties which have been linked to less heart disease and cancer. Plant Protein vs. Animal Protein: What Should You Do? When it comes to choosing animal vs. plant protein, you don’t need to pick one or the other. Each has different merits, which can be complementary if you combine both types of protein. To be sure, large studies have linked red meat, particularly processed red meat, to higher rates of heart disease, cancer, and other chronic illnesses. Raising large numbers of animals for meat can be harmful to the environment and poses animal cruelty concerns for some people. If you want to reduce reliance on red meat for your protein, plant sources can be a part of that. 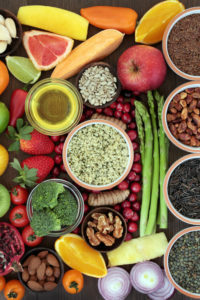 Diets based mainly on fruits, vegetables, and whole grains are associated with lower risk of chronic disease and longer life. However, research on vegetarian diets vs. diets with animal foods are inconclusive as to whether one is healthier than the other. amino acids, anti inflammatory, antioxidant, antioxidants, b12, cancer, cold cuts, complete protein, dairy, diet, diet tips, dietary supplements, digestion, essential amino acids, fiber, food, food groups, health, healthy diet, healthy diets, healthy life, heart disease, heart disease cancer, heart healthy, high protein foods, high quality protein, iron, milk, muscle, nine essential amino acids, nutrients, nutrition, nuts, omega 3, omega 3 fatty acids, phytonutrients, plant based diet, plant based protein, protein, protein diet, protein powder, protein sources, quinoa, soy, stress, supplement, supplements, tryptophan, vegetables, vegetarian, vitamin, vitamin b12, vitamin d, vitamins, vitamins and minerals, whole grains, yogurt, your bones, zinc. I was told an MD who is also a Nutritionist, that that I should eat meat, especially organ meats because I have an underactive thyroid and my thyroid needs those to keep functioning. But this was several years ago. Is that still the case? I thought you might be interested in this article on https://universityhealthnews.com: Plant Protein vs. Animal Protein: Which Is Best for Your Health?